Dennis Rodman says he was drunk when he freaked out during a CNN interview about his trips to North Korea. Dennis Rodman has been reamed by the family of political prisoner Kenneth Bae for insinuating that his incarceration at the hands of brutal North Korean dictator Kim Jong On is his own fault — and now the basketball star says he was drunk when he threw the temper tantrum on CNN on Tuesday. A chastised Rodman issued an apology to Bae’s family for his comments and for his rant in general. Rodman has been widely criticized for his chummy relationship with Kim, who, in addition to a multitude of human rights abuses against his citizens, is also rumored to have executed his own uncle for an unknown political betrayal. 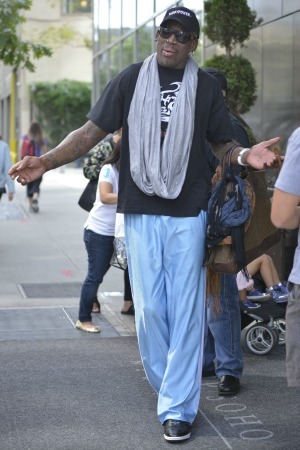 This was Rodman’s fourth trip to the secretive country. Neither the NBA nor the U.S. government say they have anything to do with the visits.